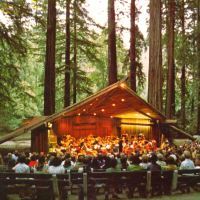 Located in a beautiful Sonoma County redwood grove—Cazadero Music Camp has been the summer home to tens of thousands of young musicians since its founding in 1957 by Robert and Beth Lutt. At the time, Robert was the Director of Bands at Berkeley High School. The first Cazadero Music Camp season had just 60 young musicians, but word of the dynamic music camp in the idyllic redwood forest spread quickly. By 1961 over 300 campers attended, and by 1964 the camp had grown to four 12-day sessions with close to 600 youth in attendance! 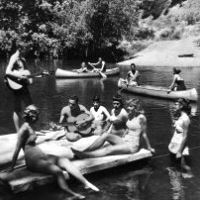 For the past 60 years Cazadero has inspired generations of young musicians, growing into one of Northern California’s most popular summer youth music camps. Cazadero now serves a diverse student body of over 1,200 young musicians every year—ages 10-18 from across the Bay Area and beyond—through two complementary youth music programs: Summer Music Camp and JumpStart in Music. 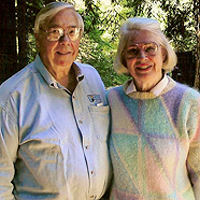 Although Bob passed away in 2011, Beth and the Lutt family still play an active role in Cazadero Music Camp as members of the Cazadero Board of Directors, and attending the concerts in the summer. Our program continues to have a lasting impact on the youth we serve, inspiring an often lifelong connection to the camp. Over a third of our Board of Directors is made up of Cazadero Music Camp Alumni who work to ensure that the Cazadero experience that they treasured as young musicians will continue to reach and inspire young musicians for the next 60 years and beyond!